So I've not blogged in 40 days--sorry about that! Things have been hectic and crazy around these parts. First I won a radio contest and my Dad was in Scotland for Christmas and Blondie Boy's birthday which was amazing. With holidays, birthdays and visitors I just barely even cracked the laptop open. Then unfortunately the week after my Dad left my Grandma Jane passed away and I flew home to Ohio for her funeral. I hope y'all understand why I've neglected my blog so much and hopefully I use this as an opportunity to come back and blog more in general! I'll admit it. I let my hair get out of control. I went six months without a cut or highlights and it went from unintentional ombre to just straight up grown out mess. Luckily Courtney and the team at Rainbow Room International George Square came to my rescue and got me ready for the new year with new hair. First off I have to say that Courtney was amazing. You know when you find that perfect stylist who knows exactly what you mean and can see what you envision in your head? That was totally her. I immediately trusted her after talking to her and even before I saw my hair I knew I'd found my new stylist! Obviously I needed a trim and shape and my highlights sorted out but I also decided it was time to mix things up a little bit and have some fun! I went blonder than I've been for awhile and without knowing it made my hair bang on trend for 2014. I ended up losing several inches and got a purple and pink dip dye to go with my brighter blond locks. I've not had funky hair since my pink under layer two years ago and it is so nice to have a bit of colour back. I love how it looks curly and it's super cute straight, too. A few days after I got it done Pantone announced that its colour of the year for 2014 was Radiant Orchid. Who knew I was such a trendsetter? 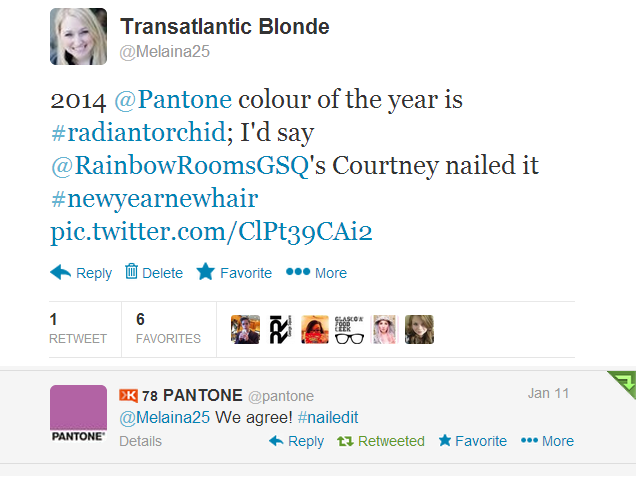 Even Pantone themselves thought Courtney nailed Radiant Orchid! I'm loving my new hair and am so happy to have found someone who I can whole heartedly trust to do my hair. I can not recommend Rainbow Room International George Square enough if you want something stylish and modern but that is also you. They don't try to force a style on you that you can't handle but they are ready to push the envelope as well. Are you doing anything new with your hair or style for the new year? Transatlantic Blonde was provided a cut and colour free of charge for the purpose of this review but all opinions are my own. I am so picky about my hair and if I didn't like it you would know--I only speak the truth! Welcome back! I'm so sorry to hear about your grandmother. Hope all is well with you and your family! Welcome back! That hair is the cuteness! Great job on your hair. I'm sorry to hear about your grandmother, I hope your time home with family helped. I have the accidental ombre going on too! I'm way overdue for some color :) What you did is super cool — how long does it last? And yes, right on trend with the color of the year. oh and WELCOME BACK! You hair is so fun! I wish I could rock some fun colors like that. So sorry to hear about your grandmother's passing. I love your hair, I would never have the guts to go for it, though I too have the unintentional ombre look going on at the moment! Way to go with your comeback hair.....I LOVE IT!!!! Welcome back - your hair looks fabulous! Thanks Ada--I will try to make it over! The pink hasn't faded much but the purple has but that is kinda just what happens. I'm going to put a lilac rinse over it to perk it back up! LOVE the hair! So pretty! Love it chick, you really suit that colour! Ooh, purple hair! Bold choice. I like it. loving the dyed tips! so much fun. Oh Man!! Remember when you dyed my hair pink in Allyson's apartment... That was awesome, and this color is amazing on you!! SO fun! I love the purple! I have been tempted to dye my hair lately but I am too scared!